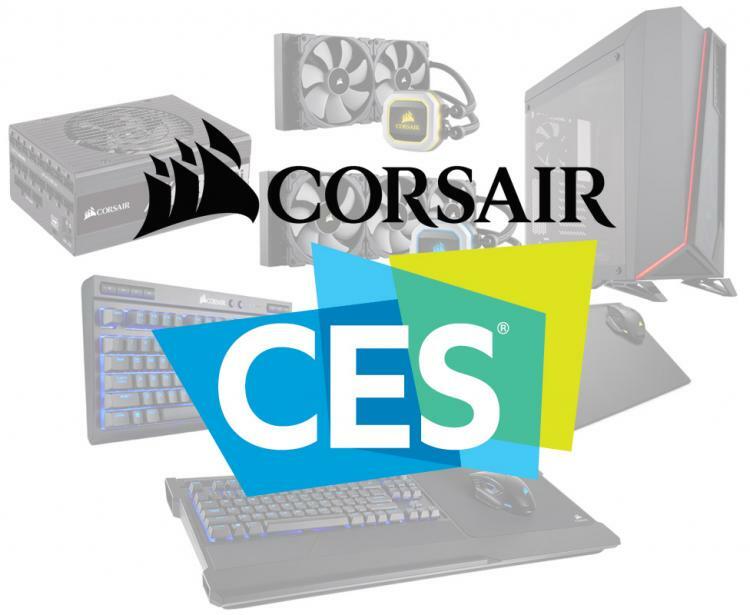 CORSAIR shows off new products at CES 2018 including a full range of wireless gaming peripherals, PSUs, Coolers and Cases. CORSAIR introduces the AX1600i enthusiast-PSU that features Gallium Nitride (GaN) transistors, delivering superior efficiency, in a smaller form factor with only 200mm length size. 1600W of ultra-stable, ultra-efficient power with 80 PLUS Titanium efficiency, complete digital monitoring and control using CORSAIR LINK software. CORSAIR also launches the new H150i PRO and H115i PRO. Equipped with 360° of RGB lighting on an aluminium-trimmed pump cap, ultra-low noise CORSAIR ML Series cooling fans, and large high-density 360mm (H150i PRO) or 280mm (H115i PRO) radiators, the new Hydro Series light up your system while keeping CPU temperatures down. CORSAIR’s new Carbide Series SPEC-OMEGA is a mid-tower gaming case with a new angle on tempered glass. SPEC-OMEGA’s unique asymmetrical design provides a dynamic look while the integrated front-panel LED light strip and LED-lit 120mm cooling further enhances dynamic styling. The case can house up to a 360mm radiator and offers plenty of cable management options including cable tie-downs, routing holes, and grommets, with a choice of white, red or black exterior. The new K63 Wireless mechanical gaming keyboard sports CHERRY MX Red switches and ultra-fast 1ms 2.4GHz gaming-optimized wireless, low latency Bluetooth® wireless, or a wired USB connection. It has per-key blue LED backlighting and a battery life of up to 75 hours. It also has a tenkeyless edition for minimalists looking for a space-saving solution. The new CORSAIR DARK CORE RGB wireless gaming mouse offers the same flexible three-mode connectivity as K63 Wireless, bringing its 16,000 DPI optical sensor precision to your PC via ultra-fast 1ms 2.4GHz, low-latency Bluetooth wireless or wired USB connection. Offers up to 24 hours of battery life. The DARK CORE RGB SE, on the other hand, has wireless charging capabilities that is paired with the CORSAIR MM1000 Qi Wireless Charging Mouse Pad. The MM1000 Qi Wireless Charging Mouse Pad ensures wireless power is always on hand, charging almost any Qi-compatible device, from the DARK CORE RGB SE to the latest smartphones. All the new CORSAIR products featured at CES 2018 are now available worldwide.